This is one of my staple meals and is super versatile – great for dinner, and equally good as leftovers for breakfast or lunch. Despite being quick and easy, it is a nutritious, filling and fully balanced meal. 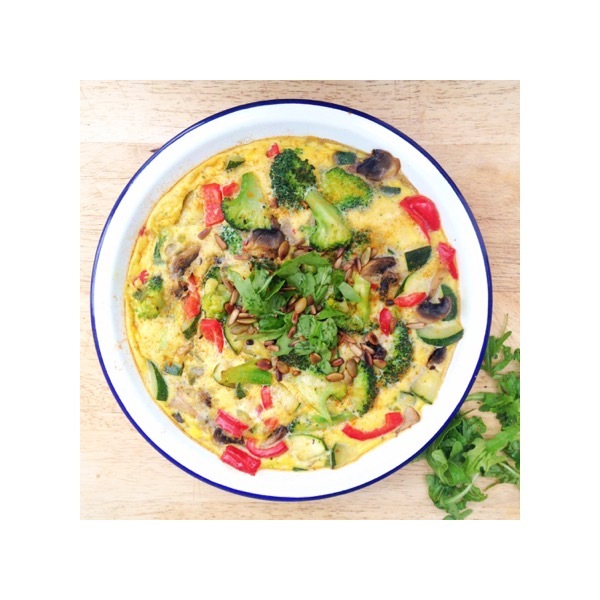 Packed with nutrient dense, antioxidant vegetables, connective-tissue-strengthening protein and brain feeding fats (eggs and coconut oil), this dish will sustain you throughout the day without any energy slumps. As always, I urge you to choose organic or free range eggs, not only for a healthier omega balance for you, but to also support independent farmers and the positive treatment of the animals and environment. Slice all the vegetables into small chunks. In a bowl break the eggs then mix in the fried veg. Pour the mixture into an oven safe dish and bake for 15-20 mins on 160 deg. Cheesy top – remove the frittata from the oven a few minutes early and cover with your favourite grated cheese before returning to the oven. For a crispy top turn the oven to grill for the last few minutes.